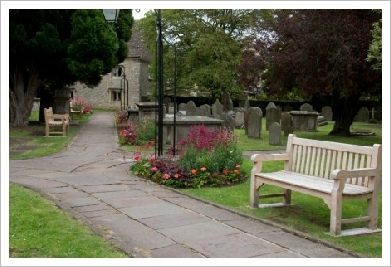 In 2009, with generous sponsorship from IHS and funding from the Tetbury Parochial Church Council, we started a long term project to improve the look of St Marys’ churchyard, including the introduction of wildflowers where we could to maintain a “country churchyard” feel whilst doing justice to the magnificent church with its beautiful slender spire that dominates the views for miles around. 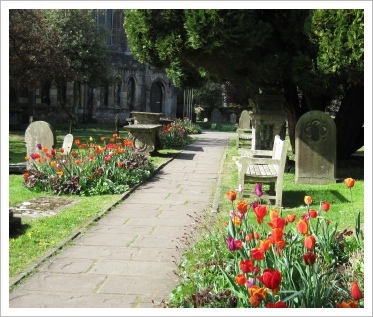 Since we adopted the churchyard much work has been carried out to create a balance between the ‘formal’ and ‘natural’ planting schemes. 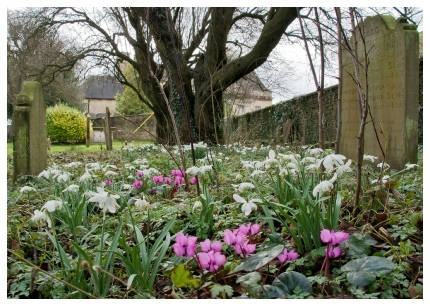 Many hundreds of English bluebell bulbs, snowdrops, autumn and spring flowering cyclamen have been planted under the trees to form carpets of flowers in the early spring. 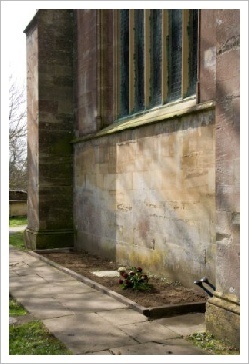 Small pockets of perennial wildflowers were planted amongst the gravestones in strategic places. The wildflowers were chosen for their flowering times and their attractiveness to butterflies and bees. They include Red Campion, Common Toad Flax, Musk Mallow, Field Scabious, Meadow Cranesbill, Bird’s Foot Trefoil, Ox Eye Daisy, Self Heal & Knapweed. These join the many other wildflowers that we’ve identified in the churchyard; Common Primroses, which grow in their hundreds, Celandine, Viola, Forget Me Not, Ivy leafed Toadflax, Cow Parsley, White Dead Nettle and wild strawberries to name but a few. 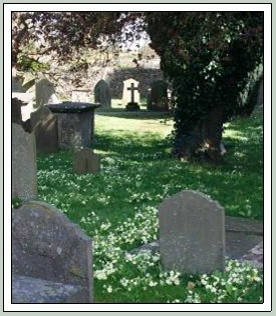 The churchyard is not only home to over 31 species of wildflowers, a survey in December 2008 of the limestone tombs and headstones by local bryologist, Peter Martin, identified 41 species of mosses - a similar group of plants as those found in boulder-strewn areas near limestone cliffs. Among them was the first recording in Gloucestershire for over fifty years of Tortula muralis aesitiva. Along the pathways, a more formal approach was taken. 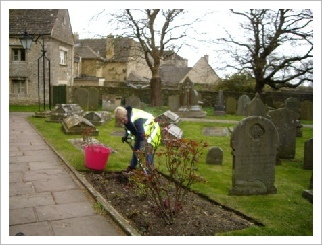 The grass has always been kept neat and tidy by the town council ground staff, however the old, haphazardly located rose beds, were in much need of attention. After careful consideration, the decision was taken to dig the roses out and find a new home for them in Anniversary Gardens. 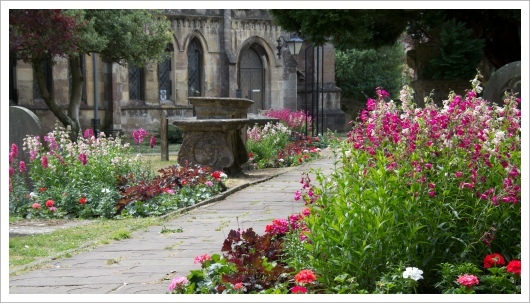 Summer display using penstemons, heuchera, antirrhinums and bedding geraniums. 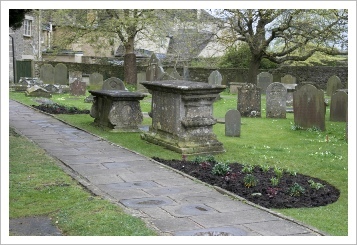 To make entering the churchyard more inviting, we created two new formal beds either side of the main gates and another bed surrounding the lamp at the end of the path to draw you in. 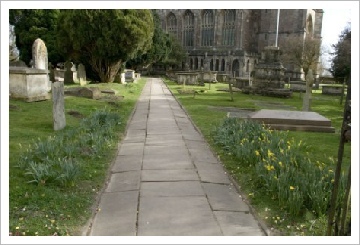 The large clumps of daffodils that were originally positioned either side of the main gates, were dug out, split and replanted throughout the churchyard. Bed surrounding the lamp at the end of the main path to draw you in. 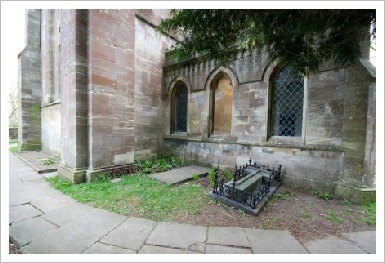 By the Bell Tower Door which is on the north west side of the church building, there is a memorial bed for two sisters of the parish, Mary Barnard and Edith Horner. In 2009 the bed was crying out for a complete makeover. 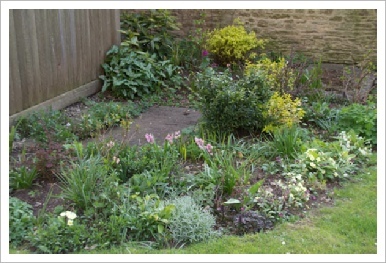 All the old overgrown shrubs were therefore removed, the bed was reshaped and the soil improved with plenty of manure. The location of this bed must win the prize of being in the windiest corner in the United Kingdom, so much thought had to be given to decide what to plant there. The location also doesn’t receive any direct sunlight apart from perhaps the very last ½ hour before the sun goes down. We decided to try planting the evergreen euonymus in the gold and silver varieties together with dark leafed heuchera. In the summer months we added bedding begonias and small fuchsias and against all the odds – they all survived and in fact thrived! 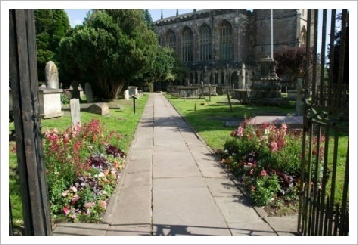 At the west side of the churchyard, to semi camouflage an electric substation, we created a mixed shrub and perennial bed using a ‘loose and informal’ planting style. Hydrangeas, ferns, pulmonaria, cranesbill, spiraea and iris, amongst others, look wonderful in this otherwise unattractive corner. 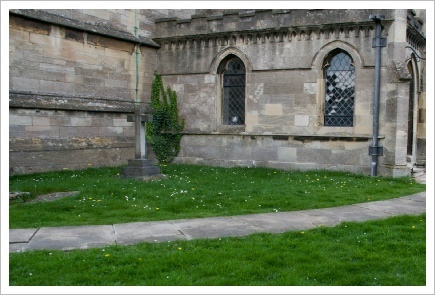 In 2011 a new bed was created at the rear of the church to surround the memorial stones of Canon Michael Sherwood who was the vicar at St Mary’s Church between 1961 and 1986 and Derek Bowsher who had been a church warden. 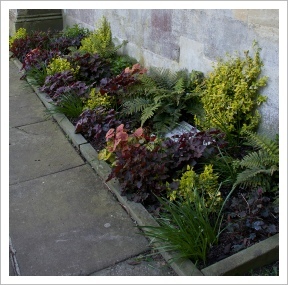 The bed was planted with different coloured heuchera, fuchsias & ferns which has proved extremely successful and is very attractive. 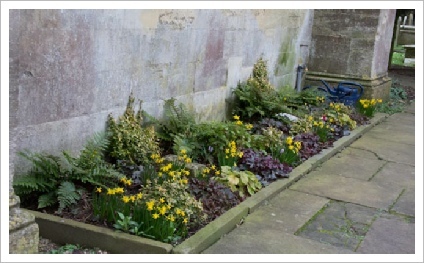 To improve the look of a dark dank corner at the rear of the church, we have planted it with shade tolerant plants such as evergreen ferns, pulmonaria, heuchera, lily of the valley, cyclamen, snowdrops, crocus to name but a few. 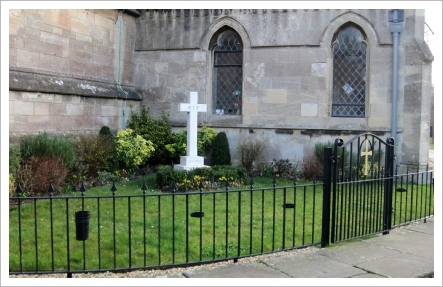 In 2014, a Remembrance Garden was created at the south west corner of the church building, where relatives can inter the ashes of their love ones. 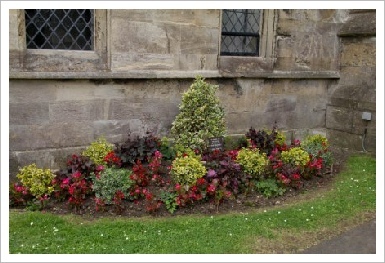 Using small colourful foliage shrubs together with long flowering perennials we designed the beds that run alongside the church walls.We also created a small bed, bordered by a low hedge of box bushes, on 3 sides of the memorial cross. 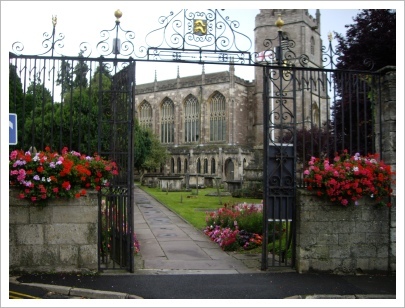 Tetbury is the home town to Highgrove, the country residence of TRH The Prince of Wales and the Duchess of Cornwall. 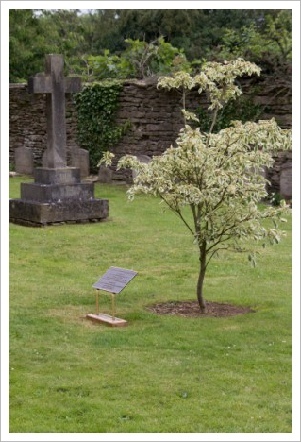 Prince William spent much time here whilst growing up and to commemorate the Royal wedding of Prince William and Kate Middleton, in partnership with the Tetbury Evening Women’s Institute (the organisation used to have two branches, named after the time of day when they met), we have planted a Wedding Cake Tree (Cornus Controversa Variegata) in the large open area behind the Church. With its small creamy-white flowers covering the green and cream leafed horizontal branches in May, followed by small black berries in autumn, it will be an attractive sight as it matures. 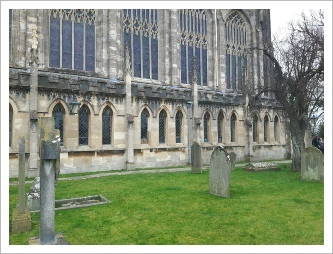 In 2017, having already purchased and installed 4 other benches for the churchyard, on which people can sit quietly and take in the wonderful tranquil atmosphere of the surroundings, we instigated the purchase and installation of 3 more to go on the south side of the church. 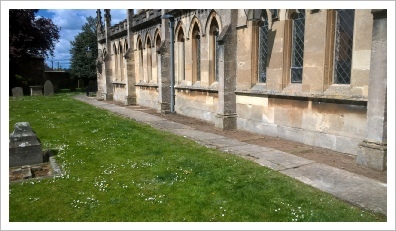 With assistance from the town council ground staff and some church members, we started the project…. 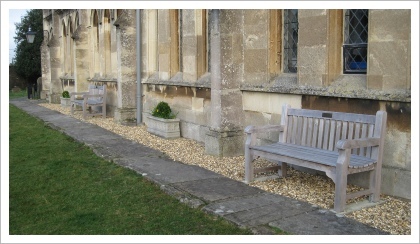 The alcoves of the building made natural spaces for the benches to be located. 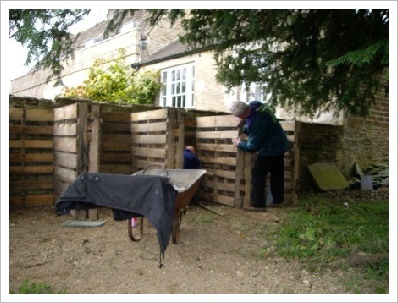 Once the grass was removed we used permeable membrane to cover the bare earth and then covered it with a LOT of gravel! 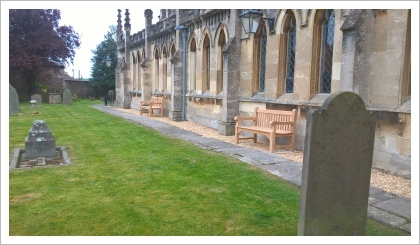 And then the benches were installed…. 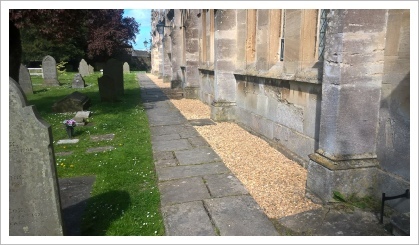 In Spring 2019, with the building of the new frontage at the West Door to allow disabled access to the church, the stone troughs that had been located either side of the entrance, were relocated to fill two of the empty alcoves. Seeing how much they softened the stark looking gravel, (Chesil Beach always came to mind!!) 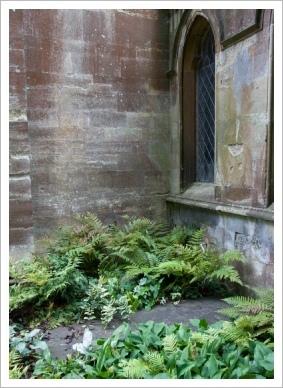 we then purchased and installed two more to fill the remaining empty alcoves. 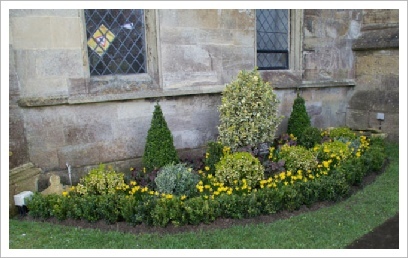 Planted with small box balls and seasonal plants (Tete a Tetes and pansies in the winter/spring and trailing geraniums in the summer) they have made a welcome addition and completed the project. 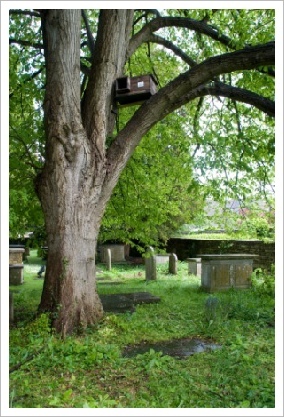 When we adopted the churchyard in 2009, we built a purpose made compost area, the slate and rubbish at the rear of the substation was removed and six wildlife nesting boxes including an owl box, were erected in the trees. 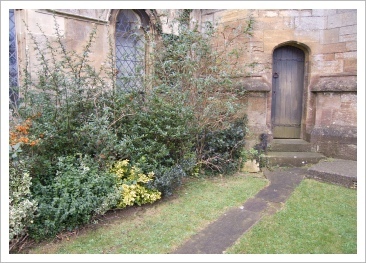 An old coal bunker situated at the side entrance to the churchyard was also altered. The roof and front were demolished and the remaining three sides were finished along the top with coping stones. 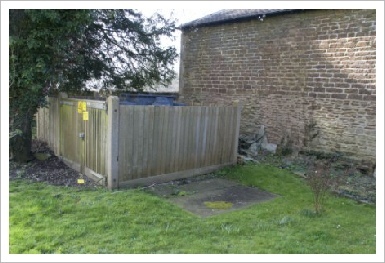 It is now a wonderfully useful ‘Bin Store’ and houses all the dustbins and green bins which use to be left out on the grass area by the gate. 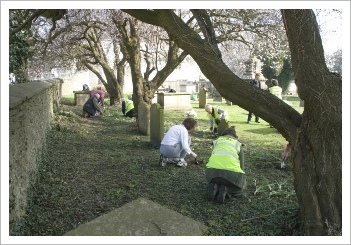 Our work within the churchyard carries on and each year we try to build on its success. 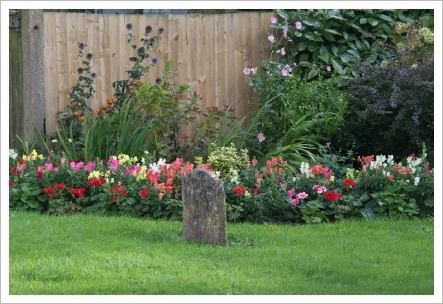 Our aim is to make what is already a beautiful churchyard into somewhere that is truly stunning. 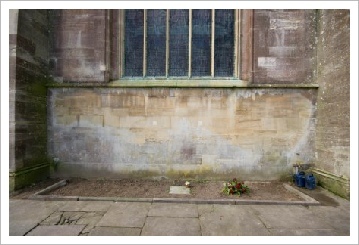 - hence there are two Saint Marys (or should that be Saints Mary? ).